1. Preheat oven to 425 degrees F. Rinse pork loin and pat dry. Set aside. 2. Mix water, tomato paste, orange juice concentrate, chili powder, salt, SPLENDA Granulated Sweetener, and white vinegar in a small mixing bowl. 3. Place pork loin in a 13 X 9- inch pan. Cover with half of the glaze. Bake 15 minutes in preheated 425 degrees F oven. 4. Remove pork loin from oven. Cover with remaining glaze. 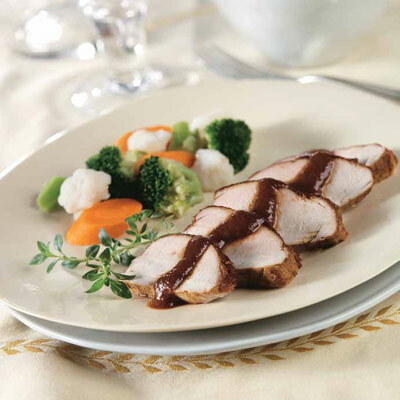 Place vegetables around pork loin. Bake an additional 15 minutes or until the vegetables are hot and the pork loin is completely cooked.